Explosive LOW brings real threat of damaging winds Sun – Mon: are you ready? The explosive LOW arrives Sunday night on the back of the parent LOW moving across today. There is a risk of significant disruption, albeit there is also a risk of NO disruption as the LOW trails further north or south and some model runs are downgrading the storm inland to 60mph max which is blowy but not as severe… in any case check forecasts regularly for updates. It’s a very tight little low so changes in track will make an enormous difference to your experience on the ground from “oh, is that all?” to something more akin to “OMG!”. In any case, the advice is to avoid unnecessary travel if at all possible and expect disruption to all forms of transport due to high winds in the SE and heavy rain further north. The strongest winds are located in the southern part of England and Wales. Here is an outline of what we can expect in the SE and Reigate in particular. The relative overnight calm will continue through the small hours until after breakfast when winds will slowly pick up, with gusts over 30mph. Bands of squally, sometimes heavy showers will pass over during the morning. More rain and gusty winds will continue through Sunday pm making it a miserable afternoon with temps barely exceeding 14c and feeling more like 9c. The highest winds exceeding gusts of 50-60mph arrive in the SE and Reigate around midnight on Monday and the winds quickly increase thereafter. High winds with gusts exceeding 50mph will be a feature of Monday morning from 0300hrs through to around lunchtime when they will die down quickly. Heavy rain will arrive with the highest winds overnight but become lighter through Monday daylight hours. THERE IS A RISK OF VERY STRONG DAMAGING GUSTS IN THE SE FROM 09:00hrs – 12:00hrs Monday, ESPECIALLY NEAR THE COAST AND IN THE FURTHEST SE CORNER i.e. Sussex and Kent; but everywhere below the red line on the map is especially at risk from this atmospheric phenomenon discovered after the 1987 storm and only observed and studied retrospectively a few times. A stingjet is a newly discovered feature which can develop in rapidly forming storms such as this. It is when cool dry air sinks from high in the troposphere and can accelerate winds wrapping around the back of an intense LOW, in this case to potentially over 90mph inland and even 100mph+ gusts are a slight possibility over the coast. There is a risk of such winds occuring anywhere along the coast of Southern England and inland towards the RED line drawn on the map above. These gusts are like a giant fist from the sky and can flatten whole forests and take off rooves as they did in 1987. if one occurs it will be one of the rare occasions when it has been modelled. The characteristic tell-tale of a stingjet is a loop or hook in the wind field or water vapour satellite photo. 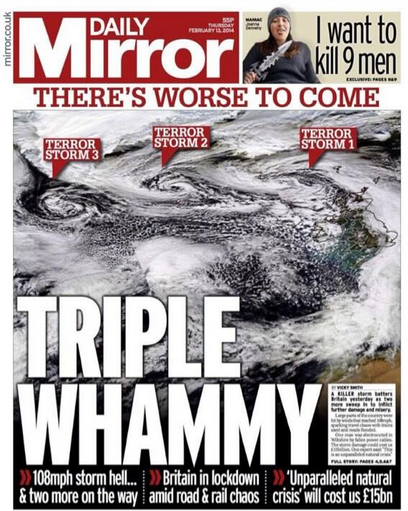 Weathermen will be keenly looking for real-time evidence of this throughout the storm. A hook-like feature on the high resolution model from NMM seems to suggest a stingjet-like formation. You can see the hook travelling along the zone of highest winds on the animation below (courtesy of NMM netweather). Read below to see what sensible precautions you should make tomorrow. OK, so this is not a hurricane and is not anywhere near the force of Sandy or Katrina but hurricane force winds MIGHT be embedded within the maelstrom, so we ought to make sensible preparations to avoid unnecessary damage. Reigate warmest in UK… again! how far will Spain rain get? A stubbornly slow moving “dishwasher” LOW spinning up west of Spain and just NE of the Azores has been abandoned by the jetstream. This LOW has sat there all week in a cool pool near the Azores. The tropical Azores have seen Tmax temps only a tad higher than Reigate this week as a cool polar pool gradually fills in that region. It is the position of the Atlantic dishwasher that controls our weekend weather. 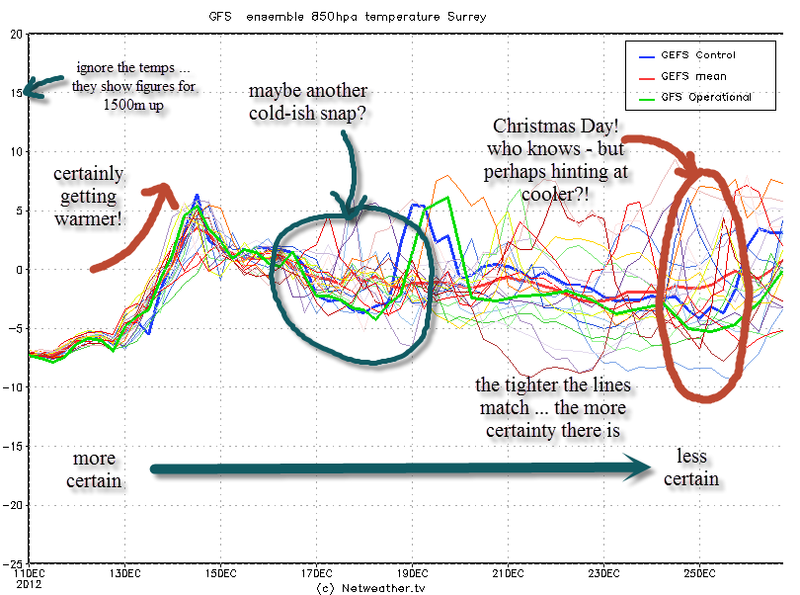 Most models agree it will edge closer but this is a slow stuttering move without purpose or direction. Infact, it’s likely that this LOW will never move across the UK because of the stubborn ridge of HIGH pressure to the NE, causing the LOW to remain stuck out west sending occasional fronts and heavy showers our way as the pressure falls. The UK will remain in a relatively warm upper southerly flow with Tmax staying into the 20s through the weekend and possibly into next week, though things are uncertain at that range at the moment. Expect windier conditions through the weekend, especially to the south coast. 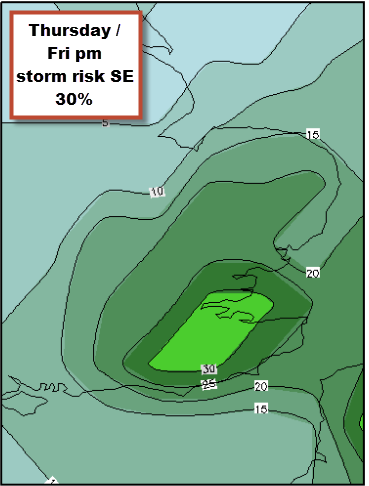 Weekend weather could possibly see thundery showers edging over Reigate sometime Saturday through to Sunday but this is dependent on the location of the LOW. Current model runs suggest the heaviest rain will stay south in the Channel but check back as updates occur. 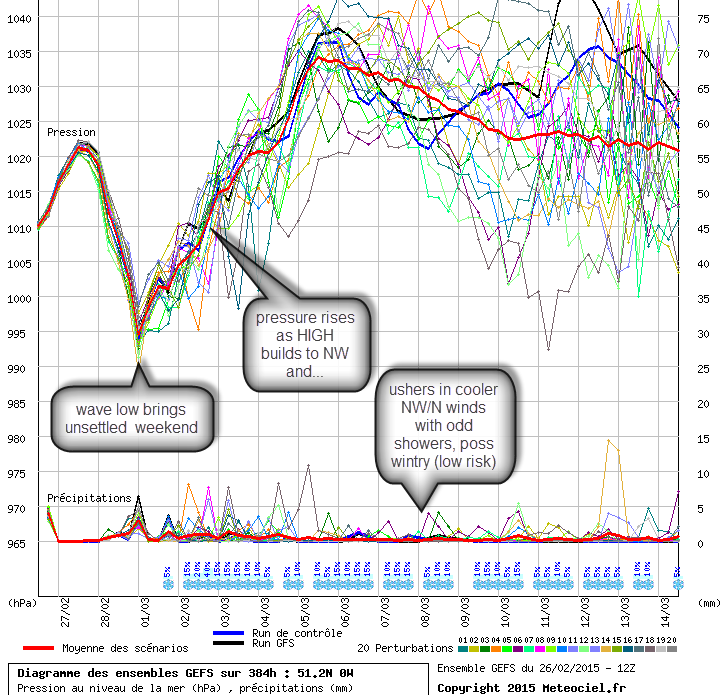 Between now and then… sluggish, overcast high pressure days with anticyclonic gloom for much of the week until the wind picks up. Reigate was, again, the warmest place in the UK today… at 23.7C matching a rounded up figure for Charlwood, Gatwick at 24c. 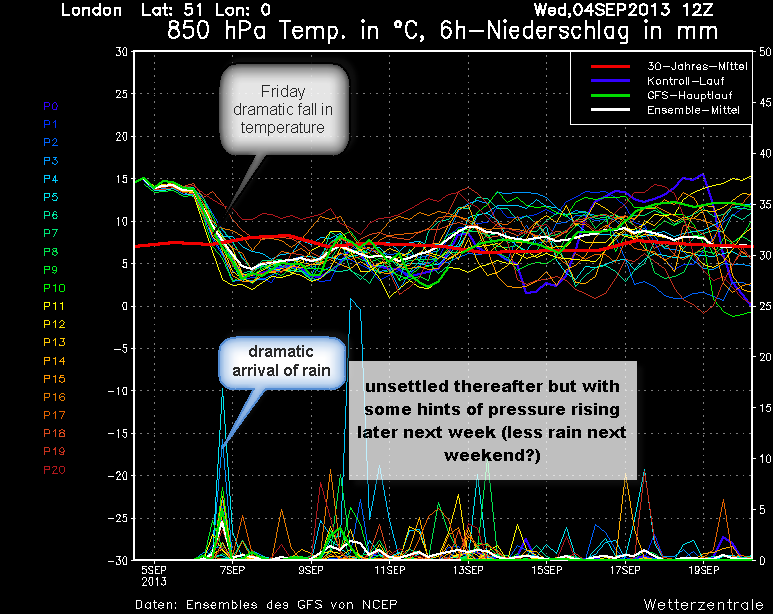 Summer ripped apart by jetstream this weekend! This weekend a big LOOP in the jetstream is set to rip up the summer heat still lingering over the southern part of the UK. 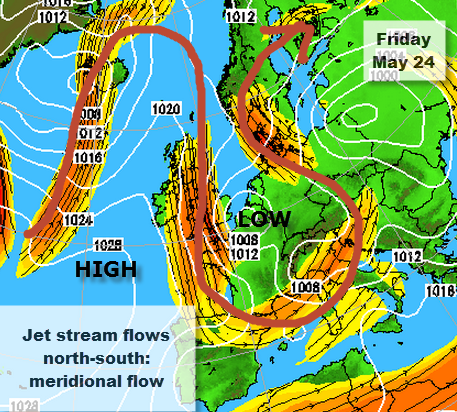 In a dramatic weather battle in the upper atmosphere above our heads the southerly blowing limb of the jetstream will bring POLAR air to west of the UK to fight it out with the continental tropical heat lingering over the south and east. Heavy rain and strong winds will be the result of this battle but the exact location of the heaviest downpours is tricky to be precise about. 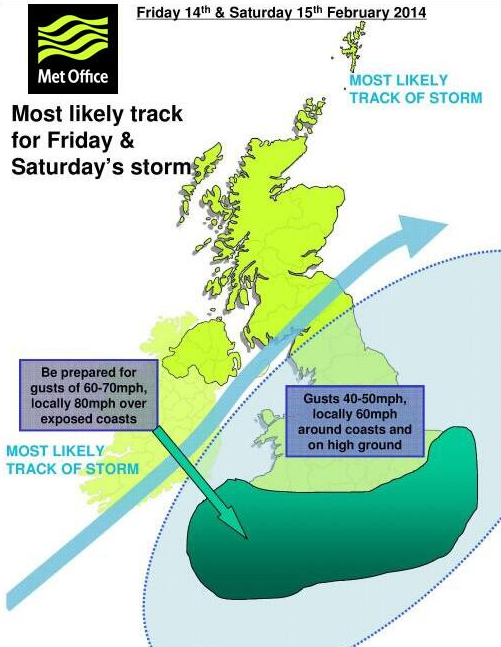 Broadly speaking, the heaviest rain will start in the South of the UK on Friday and move North, rotating over to the NW and falling heaviest over the northern hills as the LOW pressure drifts NW during Saturday and Sunday. The South could have comparatively drier days after any heavy rain on Friday, but stay tuned for details on that. Friday rainfall for Reigate could exceed 10mm starting in the afternoon – so possibly very heavy rain for a few hours Friday pm, with lighter rain through Saturday and possibly none at all on Sunday as the LOW moves away to the NW. Very warm air drifting up from the continent over England by a northward blowing jetstream will be forced to rise over the markedly colder polar air invading from the NW through Friday and Saturday. The difference between these air masses is very marked: the warm 28ºC surface air currently over Reigate equates to -12ºC at 5000m while the invading cold Polar air mass is -28ºC at 5000m, which will push down surface temperatures on Friday to a Tmax of only 16ºC! 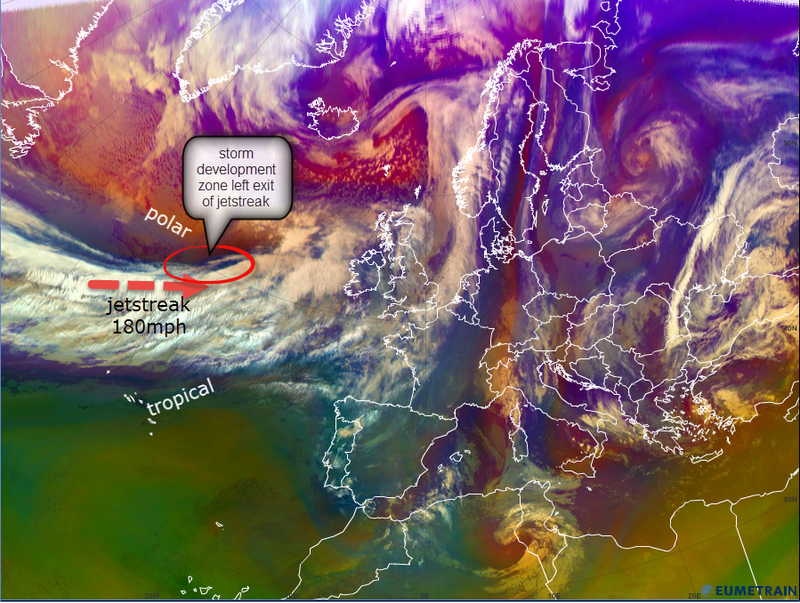 It is this contrast between the air masses which is a hallmark of autumnal weather and the key to creating lots of rain: polar air meets tropical air, forcing it skyward, forming rain with gusty winds spiraling round LOW pressure: typical autumnal scenario (except this weekend’s scenario is actually quite unusual: called a trough disruption with the surface low drifting off in an unusual direction: from SE to NW, unlike usual LOWS which track west to east across the UK along a zonal jetstream). 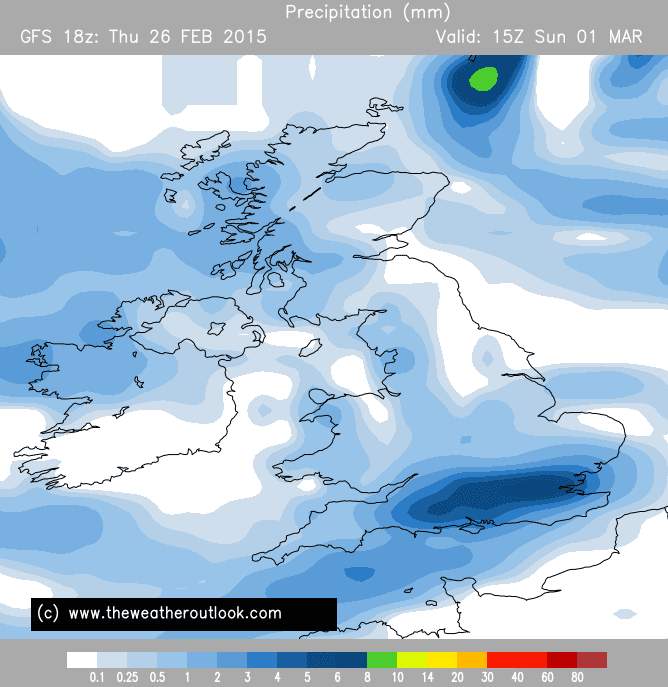 Wind speeds for Reigate this weekend could gust at 25mph at times on Saturday. No thunder is now forecast this weekend as the polar air is relatively stable, being on a return leg to the Poles. Thereafter, as you can see from the ensemble below, next week looks to remain cool and unsettled but with some improvement in the south possible later in the week as pressure could rise by next weekend, but no return to hot conditions is expected. 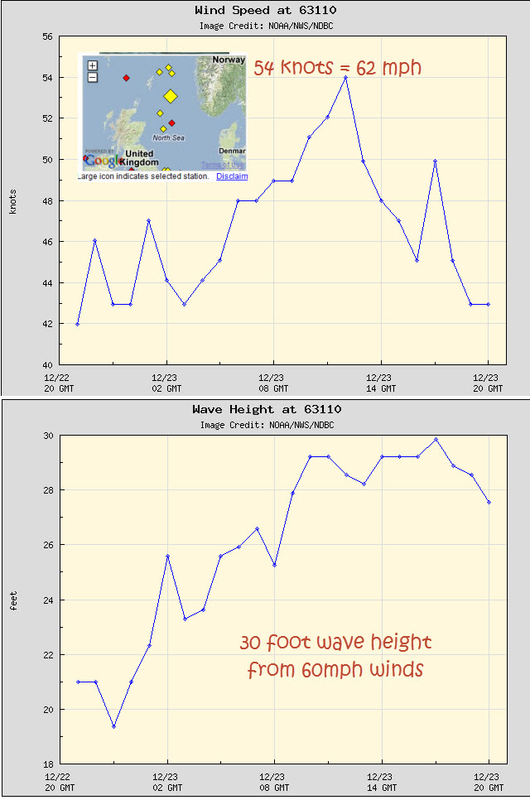 Winds in the North Sea exceeded 60 mph today, creating waves over 30 feet high. On the Beaufort Scale winds topped out at violent storm force 11. 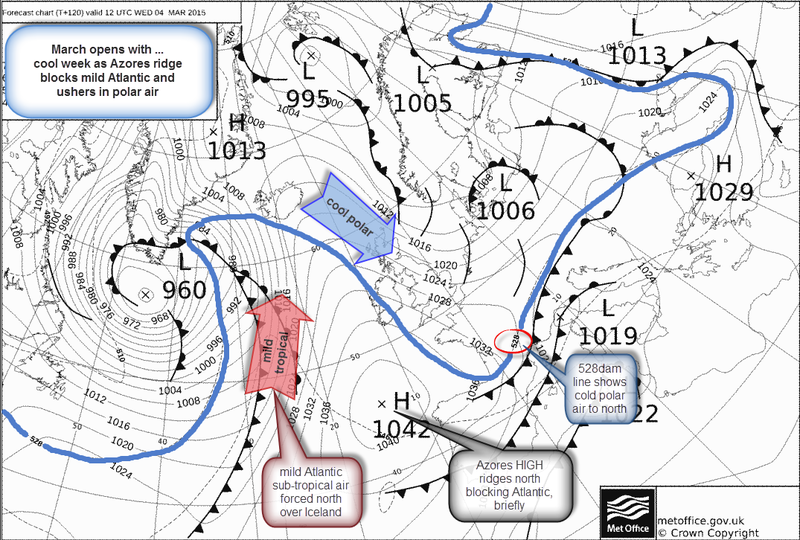 The strongest winds preceeded a frontal system attached to the same LOW pressure which brought the heavy rain to the UK yesterday. Every region of the country has flood alerts and almost every sea area surrounding the UK has been issued with gale warnings. With serious flooding elsewhere in the UK it seems that Reigate and the South East fortunately escaped any serious problems from this storm. The River Mole has burst its banks but this seems rather trivial in comparison! 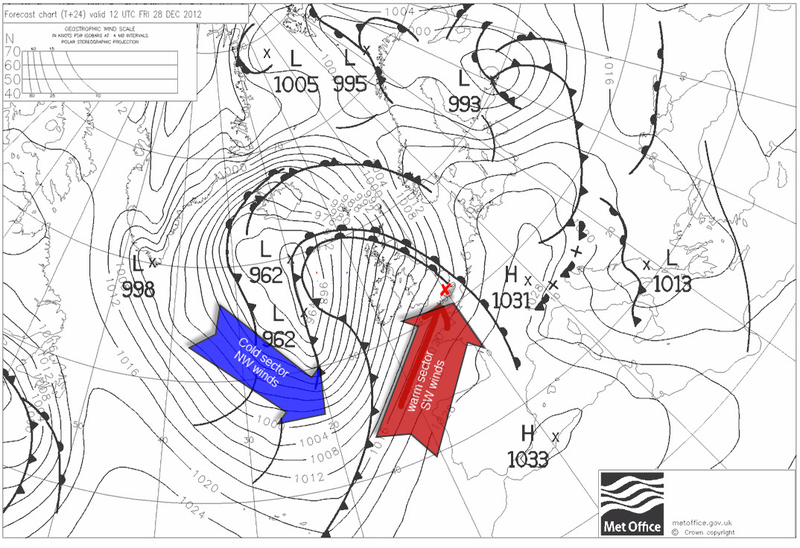 The low pressure and unsettled conditions are set to continue. after the peaceful cold … comes the wild rain! Most agree that this cold snap-ette will be beaten back by a return to a more “normal” run of LOW pressure systems from the Atlantic with attendant milder, windier and wetter conditions from the end of the week. 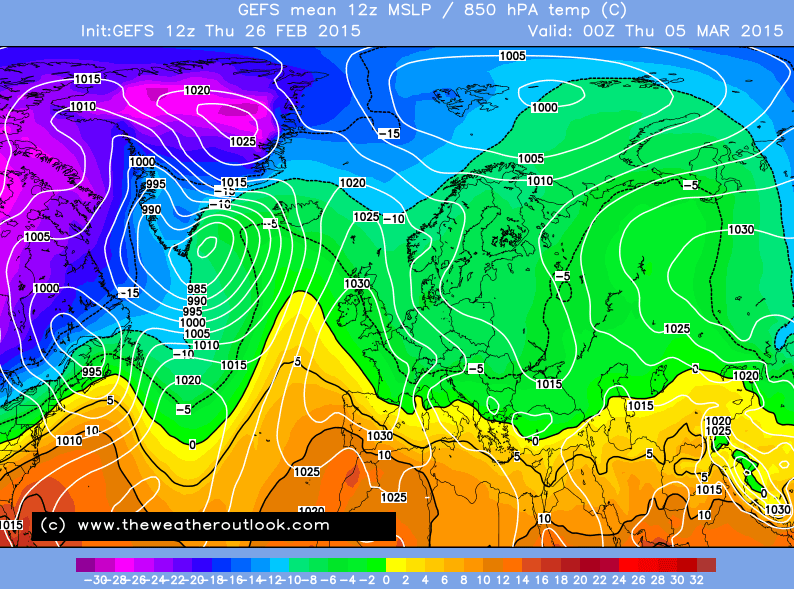 Some models show low pressure systems dominating UK weather for weeks to come and maybe all the way up to Christmas. Low pressure usually means mild, wet and windy. The temperature chart (called an 850hPa ensemble showing atmospheric temperatures at 1500m) shows a collection of temperature predictions from the Global Forecast System which spread out towards Christmas showing increasing uncertainty but overall warmer than right now.